The routine for a mother in a middle class neighborhood in American suburbia is a simple one. She tends to her family’s needs, her children’s schooling and food intake, and still strives to do better the next day. Her mind is filled with thoughts of whether or not her children are eating enough of their provided vegetables, if they will get high marks on their exams, things of that sort. And she drifts off to sleep each night, not even thinking about safety. Why? Because of the alarm system that is installed in the house, of course! The temperature is set just right, and the children’s beds and blankets keep them more than comfortable. The routine for a mother in a refugee camp in Jordan is quite different. Getting up early each day to fetch water for a quick wash, for cleaning dishes, for laundry, and for cooking. She worries for her daughter’s safety as they make their way to the communal bathroom. Figuring out what her family will eat, and how to get it. Working for a few dollars every day to make ends meet. Keeping the tent clean so that her kids have a place to call home. School is not something that is offered in every refugee camp so this mother worries about her kid’s education. And when she falls asleep each night, she can hear her children’s cries and whimpers, as they have nightmares about what they left behind. Two mothers, both filled with worry and concern for their children, yet such different circumstances. A refugee, by definition, is someone who has been forced to leave their country in order to escape war, persecution, or natural disaster. Basically, becoming a refugee is something that is completely out of that individual’s control. For children born into this kind of situation, this is just normal life. Seeing violence and other disturbing things is just another day in the life of someone escaping danger. And by the time parents can get their children out of this imminent danger and into a somewhat safer place, like a refugee camp, the effects that war has on their children’s mental health is irreversible. Or is it? The partnership of the Sesame Workshop and the Lego Foundation have a strong belief that children can mentally heal from all the trauma they have endured by one simple thing: playing. Announced in December 2018, the play-based therapy and learning programs were set up in Lebanon, Jordan, Iraq, and Bangladesh for children up to the age of 6. Initiated by the Lego Foundation, they will provide $100 million over the next five years to this cause. Sesame Street will be able to team up with the International Rescue Committee in the countries around Syria, and also with a Bangladeshi relief organization. In order to counter the effects of war on children, these organizations are set on developing new methods for the use of play in homes and schools. They emphasize learning about resilience, empathy, inclusion and most importantly, respect for difference. There have been 240 play labs that have been created for children by their very own parents; built by their fathers, and painted and decorated by their mothers and the children themselves. It is something for a refugee family to participate and take pride in, while also focusing on their own culture. A program director the Bangladeshi relief committee, BRAC, Erum Mariam has said, “We place a lot of emphasis on culture and on strengthening community engagement.“ These labs have provided the children with enough structure so that they can feel stability, safe and happiness. BRAC (Building Resources Across Communities) has received funding and plans to open at least 500 more play labs for children by May 2019. 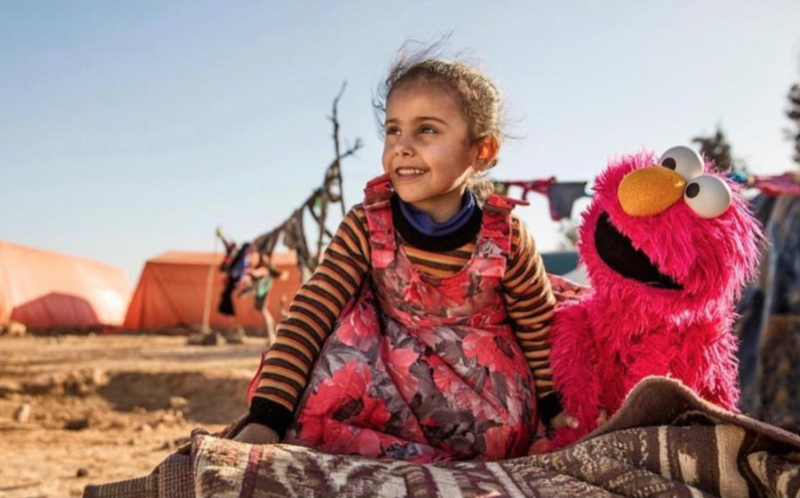 According to Sherrie Westin, president for global impact and philanthropy at the Sesame Workshop, out of all the humanitarian aid that is given to refugees, less than 3 percent goes to education. She says “If we’re not investing in education, we are not giving these children a path forward, much less a chance to thrive and rebuilt their society.” It is so important that these children be given the tools they need mentally, and emotionally at this stage of life, so that when the time comes for them to return to their homes, they are able to be productive members of their society and rebuild for the next generation. As a mother myself, and being aware of all the things going on in the world, I am thankful that I do not have to worry about my children recovering from this type of violent trauma. I am also thankful that the children who do have to endure things such as these will have a chance at healing because of the Lego Foundation, the Sesame Workshop, and BRAC. And for their mother’s sake, I am so thankful.